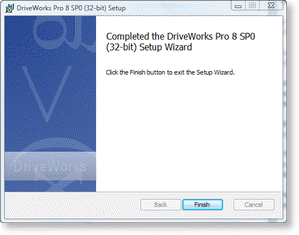 There is now a single installer for all of the products in DriveWorks Pro version 8. This unified installer means the download size for multiple products has been radically reduced, the installation process is simpler, and it is possible to add or remove products from a machine on the fly using Programs and Features in Microsoft® Windows® Control Panel. Once the required file is run the setup screen will guide you through product selection and installation. 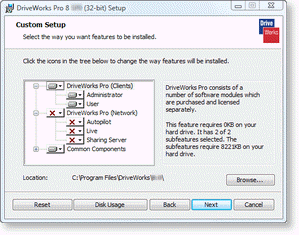 Double click the DriveWorksPro installation file to begin the installation. 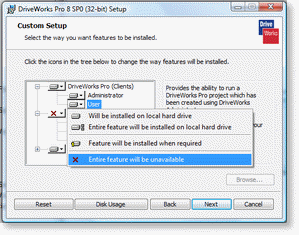 The installation files will be extracted to a temporary location, and the Windows Installer will launch. Click next after reviewing and accepting the End User License Agreement. Click the Browse button if you wish to change this location. The Administrator and User modules will be selected to be installed by default. 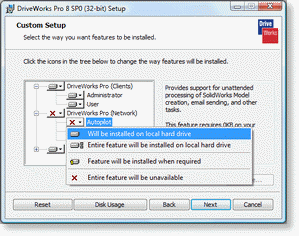 Choose any other modules you wish to install by selecting the drop down box next to the module name and selecting "Will be installed on local hard drive"
Remove any unwanted modules by selecting the drop down box next to the module name and selecting "Entire feature will be unavailable"
Click Next and then Install to begin the installation. Once installed click Finish to close the installer. Click Change to begin the removal of the selected module.